Debtor Name: APART North America, Inc. The Debtor is based in New York City. 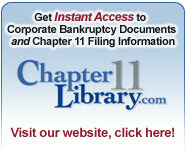 Monitor new chapter 11 retail filings with us. Contact Ken at ktroubh@nationwideresearch.com or 415-773-1230 for details. Tags: APART North America, Inc. The Fort Myers-based Debtor's petition lists approximately $43.9 million in assets and $60.35 million in liabilities. According to Court documents, the land is a "cash-flowing citrus grove" which accounts for approximately 1.2% of Florida's total citrus production. Need to monitor for new corporate chapter 11s in the food/beverage industry? Let us help. Sign up for our notification service now! Contact Ken at ktroubh@nationwideresearch.com or 415-773-1230 for details. Debtor Name: Seaarland Shipping Management B.V. Inquire about our corporate notifictaion service today! Contact Ken at ktroubh@nationwideresearch.com or 415-773-1230 for details. Tags: Seaarland Shipping Management B.V.
Do you need to monitor top 20 lists daily? Let us help. Contact Fowler at fstorms@nationwideresearch.com or 415-773-1230 to learn more about our creditor alert services.